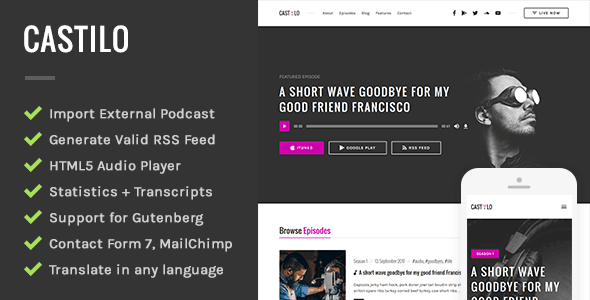 If you’re looking to launch a podcast and have total control over your website and feed, at a lower cost, Castilo is the way to go. With great documentation and outstanding support included, you’ll have your website shining in no time! You have everything you need to build a flexible podcast website, submit to iTunes, Google Play Music or any other RSS based directories. The theme is designed for you to act as the host and publisher of your show. It will generate the required compliant RSS feed, so you don’t have to get your hands dirty with other additional plugins or third-party tweaks. You can easily extract episodes from an external RSS feed into your brand new WordPress site. Just paste the feed URL, select the category assigned to the new imported episodes and voila! There is also an advanced option to schedule the import process to run from time to time. The theme makes the difficult look easy, saving you hours of extra work. With a media-rich header area, a well-chosen image or video helps you create a visual impact that instantly engages fans. It is so easy to setup and it handles all the heavy lifting. 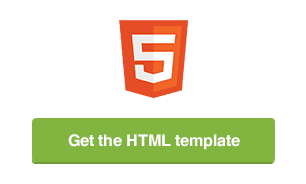 The theme has just enough functions a practical design and the execution is backed by solid research that makes it easy and viable to be used by anyone, new or experienced. Yes, you deserve to know your audience. The backend panel offers daily, weekly, monthly statistics about total listens, listeners and listening sources. You get to see how many listeners use the site audio player, iTunes, Stitcher, Google Play, direct downloads and many more. The audio files are permalinked, protecting the original ones, so nothing gets by without you knowing it. Highly optimized with mobile first techniques, the theme preview scores 98% on the page speed grade and it is faster than 95% of all tested websites. Well written code allows developers to understand the theme and extend it with ease. Hooks are used to offer a better customization experience and the episode post type and podcast functionality is stored in a separate plugin. You have the ability to preview live changes of your options, to try out a different header image, primary color and page background color. 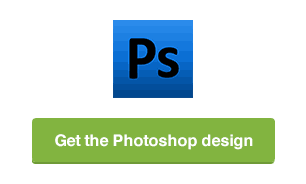 Upload a logo image for the website, which will be placed in the header to reinforce your brand. Simple and to the point. Of course if anything doesn’t make sense, or you get stuck, we are right here beside you to help with our top quality 5 star rated support. You’ll never feel like your left in the dark by yourself – woohoo! Please note that the images shown in previews are not included in the download package due to licensing restrictions. All images used are intellectual property of their respective owners and are used only for preview purposes.